Whenever weather, schedules or circumstances conspire to keep you from the flying field, scratch your flying itch with the latest Phoenix Professional RC Flight Simulator, version 5.0. Stunning graphics and incredibly realistic physics have made the Phoenix simulator not only one of the best desktop flight simulators, but a virtual RC experience with just about all the benefits of an RC club and flying field. This newest version features definitively refined physics plus new companion software you can use to create your own models, fly them and then share them online. It's always a perfect time to fly with the Phoenix Professional RC Flight Simulator. 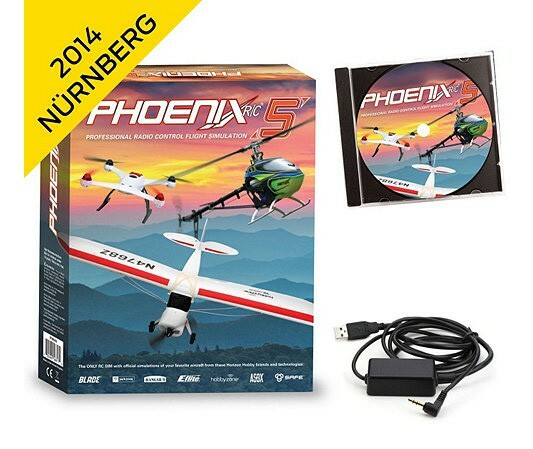 Phoenix 5 is the only RC sim with authentic Horizon Hobby aircraft simulations including the innovations they feature such as AS3X® and SAFE technology. Whether you're learning to fly without harsh consequences or just trying out that Blade heli you have had your eye on, the InfinityScape 3D landscape generator lets you fly beyond the horizon over beautiful, ever-changing terrain that you create and control.